Do you have a backup copy of your data? If your hard disk drive breaks, you can buy apps and musics but you can never buy back original data like documents, photos, emails, etc. Sync!Sync!Sync! helps you to make copies of your data by synchronizing two folders. It's very easy to set up, and once this is done, all you have to do is push a button. Of course, Sync!Sync!Sync! can also run automatically while you are away from home, or sleeping. It's also AppleScript compatible, so you can make your own backup flow. There are some sample scripts in the package, so please try to find out what system works best for you. Mac OS X 10.5 has an elegant backup system ("Time Machine") but if you want to use it, you have to prepare a huge empty HDD. If you don't have one, or you want to make backup through a network (like iDisk), Sync!Sync!Sync! is a better choice. 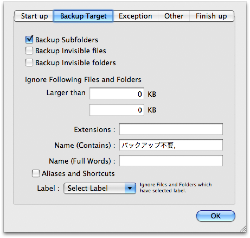 It's very easy to set up a new back up, just choose an original folder and a backup folder. Then you can customize the backup by choosing appropriate backup style and detailed setting step by step. Sync!Sync!Sync! can be run automatically by itself. 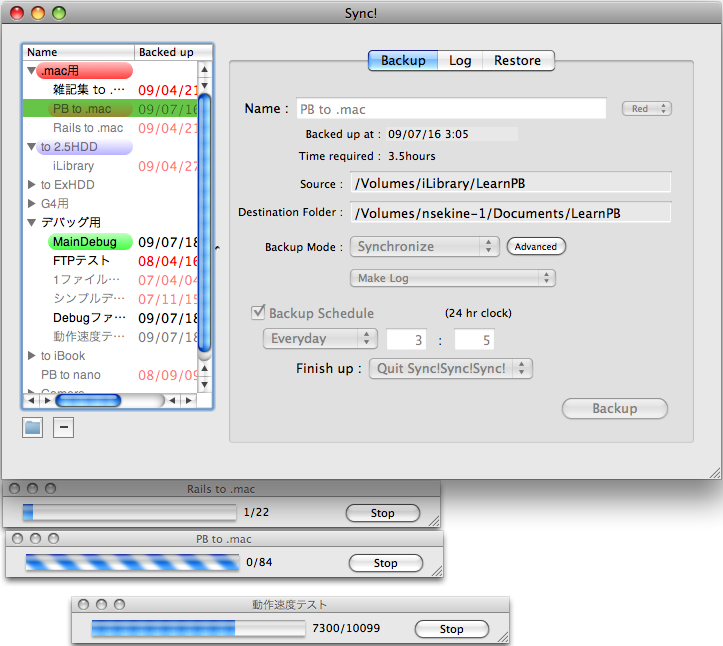 User just needs to choose a day of week (or everyday) and time to run backup, then Sync!Sync!Sync! starts up and runs backup automatically on schedule. It's very easy to back up files to iDisk at midnight. 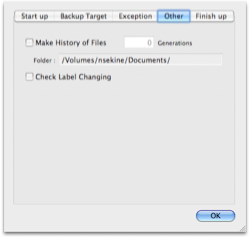 Not only is it easy to set up a backup not only to external HDD or USB Flash Drive like iPod, but also it's available to back up to any device which can be mounted on Finder like network server, iDisk (webdav server), other Macintosh via Wifi or FTP server. Sync!Sync!Sync! provides various backup methods like "Add copy", "Synchronize copy", "Two-way copy" and so on. Sync!Sync!Sync! also provides various "Selectional" backup methods which allows user to check and choose files to be backed up or removed. About difference of those backup methods, please refer to the manual. It's possible to use more detailed setting. User can determine files not to be backed up with its file name, label, file size and so on to save the space of backup drive and shorten running time. It's available to stock the backed up file history (Leave older file for certain period). The backup process is very fast. The backup via network can be slower depends on the network speed, but the backup to external HDD will be done very quickly. Sync!Sync!Sync! runs designated AppleScript before/after backup. 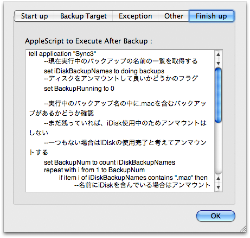 For example, it's possible to mount iDisk or network server with AppleScript before backup and unmount the volume and send result via EMail after backup. The Sync!Sync!Sync! package contains various sample script like mounting iDisk or sending Email, please refer to those script. Sync!Sync!Sync! itself also supports AppleScript so it's available to run backup with AppleScript. 01.26 v6.0.5 Fixed a bug that scheduled back up doesn't work when the app was newly installed. etc. Sync!Sync!Sync! limited edition (LE) is freeware. 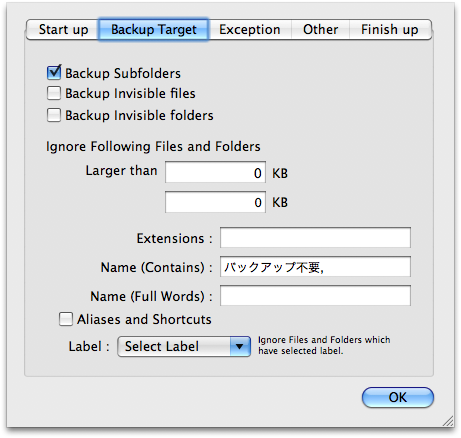 It can make 3 backup sets and instant backup is not available. Sync!Sync!Sync! unlimited edition is shareware and it doesn't have any limitation. It costs $15. Please refer to licensing information. 19.01.26 6.0.5 Fixed a bug that scheduled back up doesn't work when the app was newly installed. Fixed Japanese back up log format. 19.01.12 6.0.4 Fixed a bug that the app may crash while scheduled back up. 18.10.21 6.0.3 Fixed a bug on back up history function. Fixed a problem about English interface. Changed supported OS version as MacOSX 10.10 or higher. 18.10.08 6.0.2 Supported MacOSX Mojave. 18.01.13 6.0.1 Fixed some minor bugs. 14.03.22 6.0.0 Updated Back up function. Changed to display estimated time to finish. 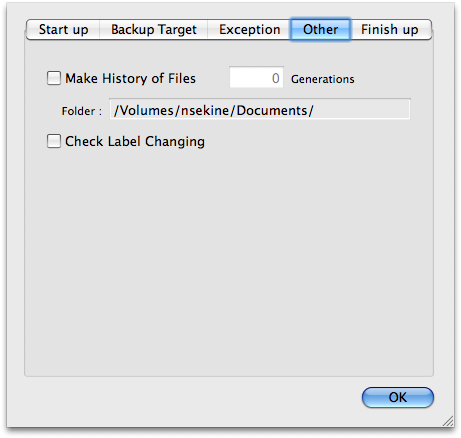 Added function to screen backing up file with MacOS10.9 tag. 13.07.27 5.1.5 Fixed bug that the app cannot be launched on specific condition. 13.04.20 5.1.4 Fixed bug that the set name cannot be dragged. 13.02.03 5.1.3 Fixed bug that the source/destination path cannot be changed in English environment. 13.02.02 5.1.2 Fixed bug that new backup set cannot be added when multiple sets exist. 13.01.13 5.1.1 Fixed bug that the app cannot be launched on English system. 13.01.12 5.1.0 Adopted to MacOSX10.8 notification center. Fixed some bugs about selectional backup. Changed application requirement to MacOSX10.7 or higher. 12.08.04 5.0.2 Fixed a bug related to FTP backup. Changed to stop auto re-launch function if Sync!3 crashes 3 times in a row. 12.06.16 5.0.1 Minor modification for finish of MobileMe service. 12.05.12 5.0.0 Added FTP backup function. 11.11.05 4.5.1 Fixed bug that the app didn't run on MacOSX10.4.x. 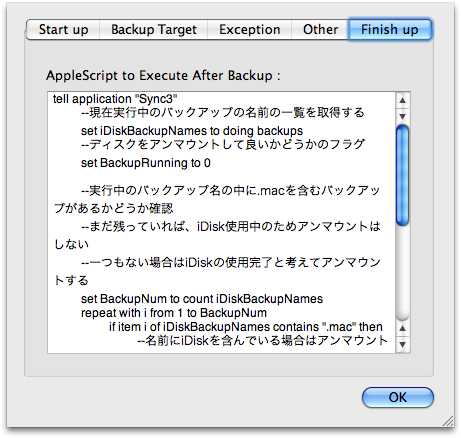 11.10.22 4.5.0 Added function to display a reason when the selected backup cannot be run. 11.07.09 4.4.3 Fixed a bug that the label screening function didn't work. 11.06.25 4.4.2 Added menu to re-open main window. 11.04.16 4.4.1 Improved performance a little. 10.12.11 4.4.0 Added Single Window mode. 10.08.14 4.3.1 Improved to record number of removed files in log. Fixed a bug that the app couldn't handle Finder label on MacOSX10.5.x. Fixed a bug that the app might crash if the app was displaying the processing file names. 10.06.26 4.3.0 Added feature to show processing path while backing up. Fixed bug that Sync!3 failed to check Finder label on MaxOSX 10.4.x. 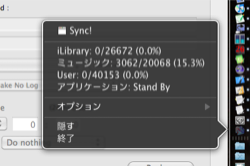 10.05.15 4.2.2 Fixed bug that Sync!3 failed to check Finder label. 10.04.17 4.2.1 Fixed bug that the app couldn't update log. 10.04.10 4.2.0 Added "Cache optimization" feature. 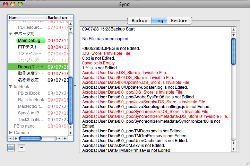 Fixed bug that Sync!3 crashes when the backup is executed while displaying a log. 10.02.27 4.1.3 Improved error handling when the app fails to copy a file. 09.12.26 4.1.2 Added function to duplicate backup set. Improved Undo behavior of manipulating backup sets. Fixed bug that selectional backup couldn't be canceled while displaying selection dialog. Improved backup set table to display selected set name as white colored text. 09.11.21 4.1.1 Fixed bug that Sync!3 couldn't screen files by Finder label. Improved stability of back up. 09.09.30 4.0.1 Fixed bug that helper application "NSASLaunch" crashes unexpectedly on MacOSX10.4 & 10.5. 09.09.26 4.0.0 Added "Force copy file" option. Change to stop bouncing app icon on dock in 3 seconds when backup has been done. Added function to notify the finish of backup via Growl. Added function to display the progress of backups as dock menu. 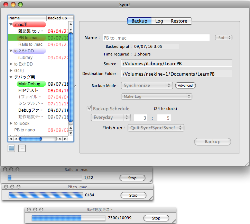 Fixed bug that Sync!3 doesn't save the width of backup set table width. 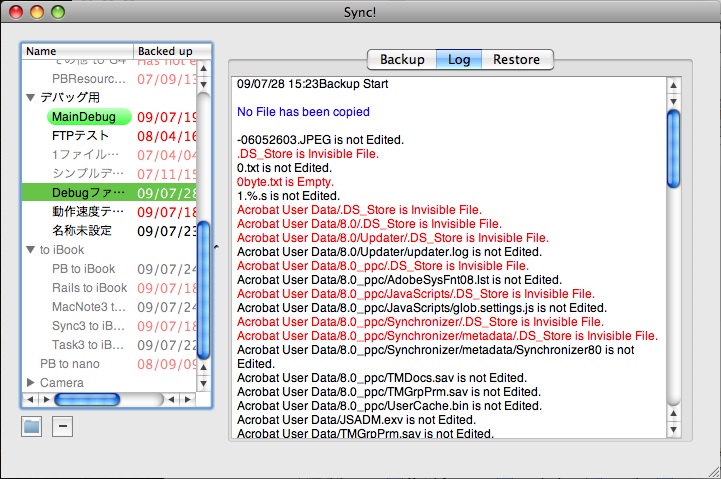 09.08.22 3.9.3 Fixed bug that Sync!3 runs everyday if scheduled backup is set on Sunday. 09.07.22 3.9.2 Fixed bug that Backup schedule function did not work on some environment. 07.06.09 3.0.0 Rewrote almost everything and released as Version 3.